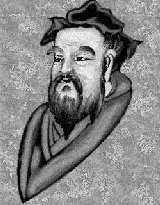 Confucius (a Latin translation for K'ung Ch'iu) was born into a noble clan. His father, a state commander, died when K'ung Ch'iu was just three, leaving the family impoverished. Nonetheless Confucius was well-educated, possibly through his own efforts and reading. For four years after his marriage at age 19 he was obliged to work as a laborer due to poverty. He had two daughters and one son. Confucius began teaching after his mother died in 527 B.C., traveling the district and speaking on ancient values he felt the people had forgotten over time. Confucius was living in a time of great upheaval and social and political corruption in China, and he therefore desired to restore people's social and ethical behavior to the former high moral standards of their ancestors. His desire to revive rather than create is reflected in the fact that he did not put into writing the principles that he espoused; his teachings were recorded by his disciples in the text Analects (Lun Yü). For his own part, he taught from ancient sources, and demonstrated his teachings daily for he believed rulers could achieve personal greatness and success for their states only if they led their lives in an exemplary fashion. He held that the human duty was comprised of five virtues: kindness, uprightness, decorum, wisdom and faithfulness; and emphasized individuals' responsibilities to the state. In addition he held parents (of the past and present) in high regard and exhorted others to do so as well. Confucius quickly gained fame and respect for his teaching and at age 51 was named minister of crime in the state of Lu. He was so successful in implementing reforms based upon his principles that crime was virtually eliminated. His accomplishments, however, incurred the jealousy of a neighboring state's leader who sought to remove Confucius from his post. After 496 B.C. Confucius therefore resumed his earlier occupation of traveling and teaching while seeking a new employer. The search was in vain, however, and in 484 B.C. he returned to the state of Lu where he wrote commentaries on classic texts, and, it is believed, a history of that district from 722 to 481 B.C. He was buried in a tomb at Ch'ü-fu, Shandong, following his death circa 479 B.C. His teachings continued to be of tremendous influence on succeeding generations and were used as textbooks from the time of the Han dynasty (circa 206 B.C.) onwards, for roughly 2000 years.